You are browsing the archive for tartu. The Pairs event was of a standard slightly harder then the individual quiz, but a lot easier then the four person team quizzes. 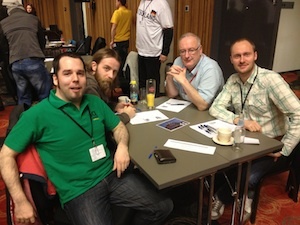 We were sitting at a table with a Top-10 quizzer Ronny Swiggers, from Belgium, and his partner. We didn’t disgrace ourselves at all, getting a lot of answers the Ronny pair couldn’t answer. Pat Gibson and Kevin Ashman, neither of whom (amazingly) made the Top 10 individual final, won the event, so our Padraic and Derek chose the right quizzers to be photographed with! So the fun quizzes did actually take place on Saturday night, but in a different venue. I would have liked to try them out, but instead spent the early morning drinking with members of the Quiz League of London. They are talking about having a quiz weekend of their own the weekend after the World Quizzing Championships next June, with four or five countries already confirmed, along with eight English regional teams, so that is something we can think about. On the Sunday afternoon the Nations Cup final between England and Finland took place. It was a very high standard, neck and neck most of the way. England pulled away towards the end, thanks to a slightly stronger history knowledge base. Individual quiz tablemates: Me, Kay, David and Jakob. Righto. After my snafu earlier with the backspace key, I feel I owe you all some questions. First, I need to report on how we did in this morning’s Individual Quiz. This event sees us all taking part on our own (the name would imply that, wouldn’t it?!) in eight rounds, the first seven each having 12 questions and the last round featuring 16. There are no themes or category rounds. Each one is mixed-bag/general knowledge/whatever you want to call it. Table places are assigned based on the number we each have in the bottom-right corner of our name tags. Funnily enough, I ended up at the same table (11) as my colleague on the Irish team, David Fay. There we were joined by Kay from Norway and Jakob from Denmark. At the end of each round, you simply swap your answer sheet with the person across the table from you, Jakob in my case, and the answers are then called out from the stage. We were all of roughly the same standard which was nice as it meant we did a lot of sympathising with each other after certain rounds. On one occasion, I “top-scored” with 2/12, whilst the others all got 1. Sufficed to say, we had a bit of fun with the whole thing. 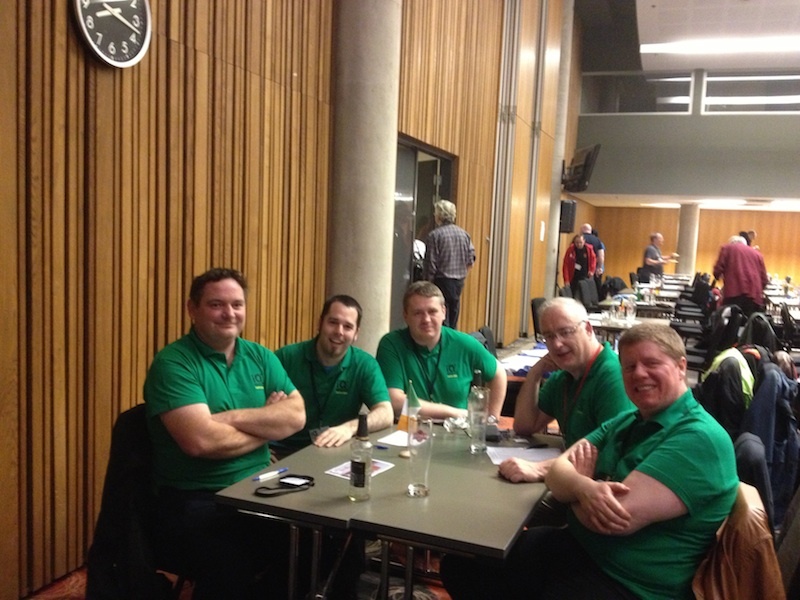 The Irish team: Padraic Fanning, John Nolan, Derek Cray, David Fay and Lorcan Duff. This year’s European Quizzing Championshipsare taking place in Tartu, Estonia. Ireland are respresented at this quiz festival by a team of five people: myself, Drek Cray, Lorcan Duff, Padraic Fanning and David Fay. Getting to Tartu is a challenge in itself. It’s Estonia’s second city but Estonia isn’t that big a place. Thus, while Tartu does have an airport, it is only serviced by flights from two destinations – Tallinn and Helsinki. I didn’t see the point of flying to Tallinn and then on to Tartu, when Tallinn is all of two hours away by road and, unfortunately, there is no easy way to get from Ireland to Helsinki. Well, certainly no way at times that suited us. Two of the team arrived in Estonia on Thursday night, staying in Tallinn before making their way to Tartu yesterday morning. 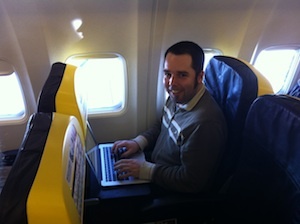 Myself, Padraic and Derek were even more efficient. We left Dublin at 6.45am and flew to Riga, the captial of Latvia. Air travel can be a bit mysterious at times. Why does it take practically an hour to fly Dublin-London and it took us just 2 hours and 35 minutes to fly from Dublin to Riga?